Another New England summer is upon us. School is out, employees are taking much needed vacations; hitting the water to fish, water ski, vegetating on the beach or heading to Camp. This time of year puts many more vehicles on the road, including motorcycles. Your driving skills, patience, and commitment to safety are going to be tested as summer moves along. All of you are professional drivers. Put safety first and let’s enjoy what summer brings. EOBDR’s – By now, all units have the EOBDR’s installed with the majority of drivers using them. It has been a work in progress with corrections being made as we move along. Once everyone is comfortable using the system and kinks get worked out, will we stop using paper logs. I will let you know when that times come. Our Annual Meeting was a great success. We are so proud to have two (2) Drivers of the Year. Eric Johnson and Jim Donovan are to be congratulated for their professionalism and commitment to safety. The Company would like to see all our drivers accept this award during our next Annual Meeting. Safety Steve has been busy as well. Much of his time has been spent being the Chairman of the 2014 MA Truck Driving Championships, Chairman of the MMTA Safety and Compliance Committee and as the Eastern Regional Chairman for the National Tank Truck Carrier Association’s Safety and Security Council. 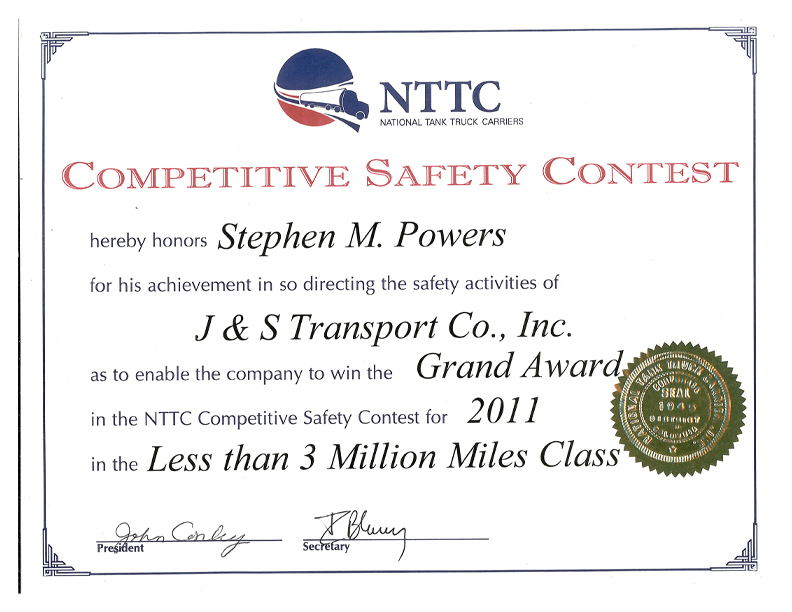 Steve traveled to San Antonio, TX to accept the Grand Safety Award presented to J&S Transport. 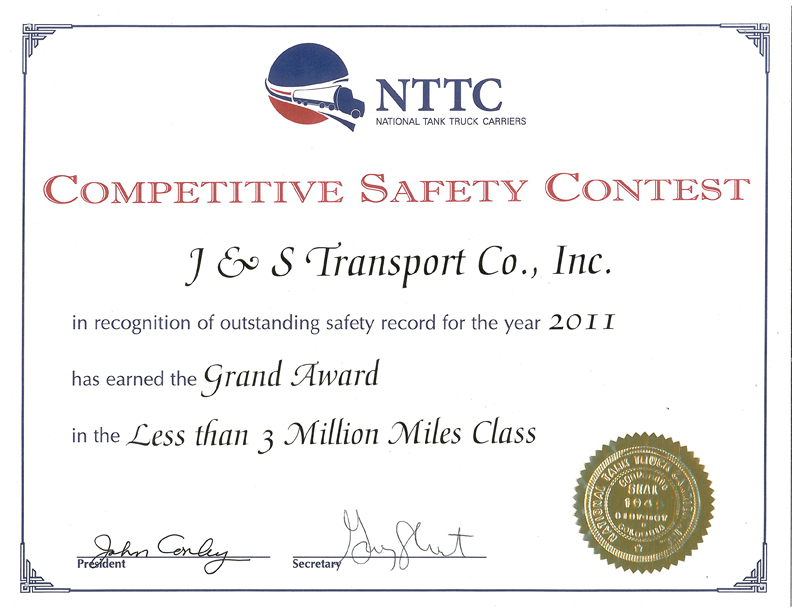 This award was earned by the Professional Drivers of J&S Transport and will be proudly displayed. While in San Antonio, Safety Steve was notified of his election to the MMTA Board of Directors. J&S Transport has positioned itself to be a player when addressing those issues affecting our Industry, something our competitors have not done. We hope to see great improvements with our Industry is the years to come. Too many news stories are on TV and in newspapers documenting fires which kill, injure and leave people homeless. Although deaths and injuries from residential fires have decreased in the past several years, deaths from fires and burns are still the 3rd leading case of fatal home injuries as determined by the Center for Disease Control. 70% of those deaths are from smoke inhalation. The National Safety Council has determined that two-thirds of deaths from residential fires occurred in homes with no smoke alarms or no working smoke alarms. Fires are more likely to happen in certain areas or by certain equipment in your house. Be extra careful while you are cooking, smoking, being around candles, furnaces, electrical cords, fireplaces, and with children, toddlers and babies nearby. According to the U.S. Fire Administration, cooking equipment, most often a range or stovetop, is the leading cause of reported U.S. home fires and home fire injuries.